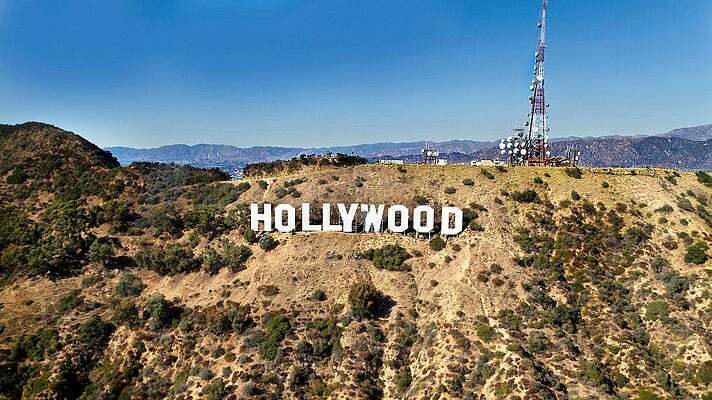 Located in the center of Los Angeles, Hollywood is a global symbol of glitz, glamour, and filmmaking history. It’s a place where people come from all over the world to reinvent themselves and chase the American dream. Home to some 90,000 residents, Hollywood is a highly diverse, densely populated, and thriving neighborhood. Beyond the landmarks and attractions, Tinseltown offers a variety of outdoor activities as well, including kayaking, hiking, and horseback riding. Read on for a weekend itinerary of outdoor adventure in the Entertainment Capital of the World. The home base for your weekend adventure is Mama Shelter, located on Selma Avenue a block from Hollywood Boulevard and a ten-minute walk from the Hollywood/Vine Metro Station. 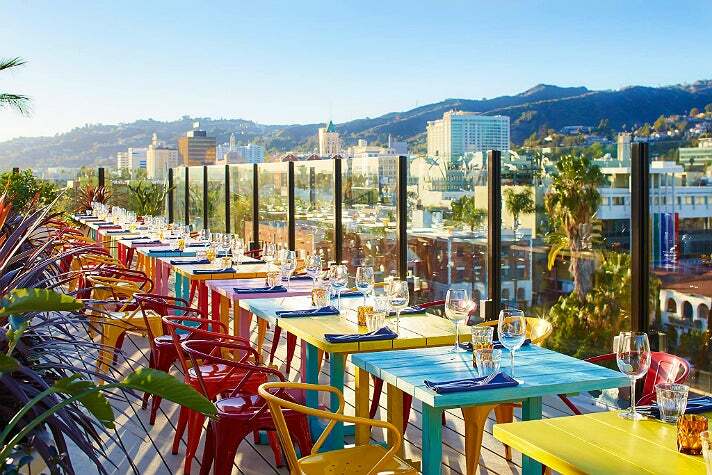 Combining Southern California cool and French chic, the 70-room boutique hotel was designed by Thierry Gaugain to offer an eclectic and energetic ambiance, thanks to its friendly, warm and casual common areas. Get an early start at Mama Shelter's coffee shop, which opens at 7 a.m. Fuel up with the hearty Breakfast Package, or go lighter with an acai bowl or yogurt parfait. Located just two blocks from Hollywood Boulevard, the 160-acre Runyon Canyon is one of L.A.'s most popular hiking destinations. Runyon Canyon is an ideal spot to work up a sweat and catch a glimpse of your favorite star. Celebrities like Justin Timberlake, Tyrese Gibson and Anne Hathaway have been spotted making their way to the peak of Runyon. 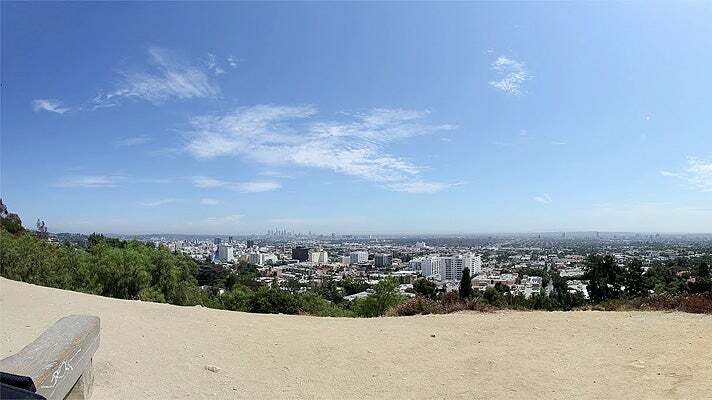 After enjoying the panoramic views at Runyon Canyon, it's time to explore the city in a whole new way with Fantastic Race, the "world's first competitive sightseeing tour." 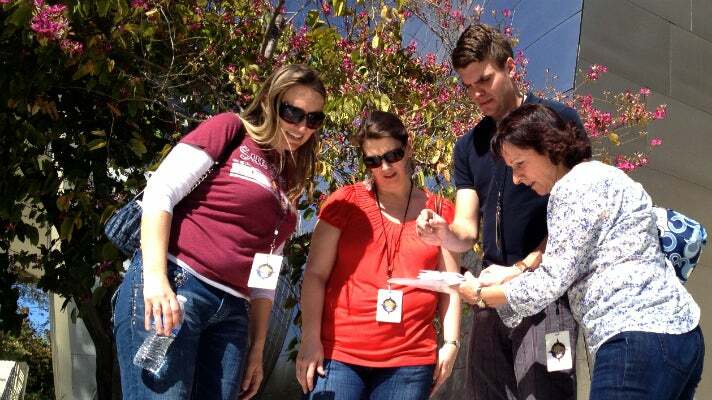 Fantastic Race is an interactive, clue-based adventure game that's described as part scavenger hunt, part self-guided tour, part race and all fun. Starting lines are located in the parking lot of the Hollywood Bowl (Saturdays) and Dave & Buster's at Hollywood & Highland. You'll probably be famished after your Fantastic Race adventure, so it's a good thing that Hollywood offers numerous lunch options. 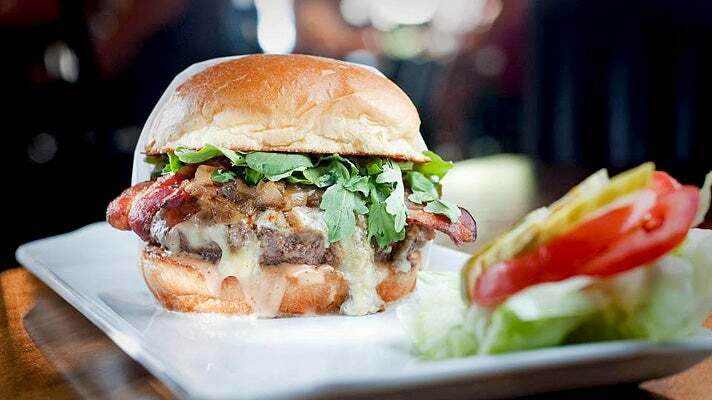 Open 24 hours a day, 25 Degrees at the Hollywood Roosevelt Hotel offers several signature burgers, including the popular Number One with caramelized onion, crescenza, prelibato gorgonzola, bacon, arugula and Thousand Island. Customers can also create their own burger from an extensive selection of meats, cheeses and extras. Pair your burger with a craft beer or indulge in the infamous Guinness Milkshake - you've earned it! After lunch, head to the 4,300-acre Griffith Park, one of the largest urban parks in North America. Renowned as one of L.A.'s top destinations for outdoor enthusiasts, Griffith Park offers miles of trails, camping, and even golf. For a great hike, try the West Observatory Trail, a moderate two-mile climb that leads to the world-famous Griffith Observatory. At the top, you’ll be rewarded with spectacular views of Los Angeles, including the iconic Hollywood Sign. Movie buffs can't miss Bronson Canyon, located in the southwest section of Griffith Park. 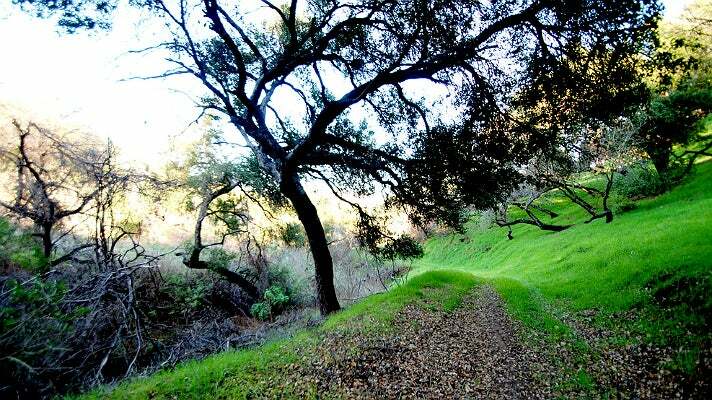 A popular location for generations of filmmakers, Bronson Canyon has been featured in classics like The Searchers and Invasion of the Body Snatchers, as well as more recent films like Star Trek VI and Army of Darkness. “Bronson Cave” is actually a 50-foot long tunnel, the remnants of a quarry that was founded in 1903 and originally called Brush Canyon. 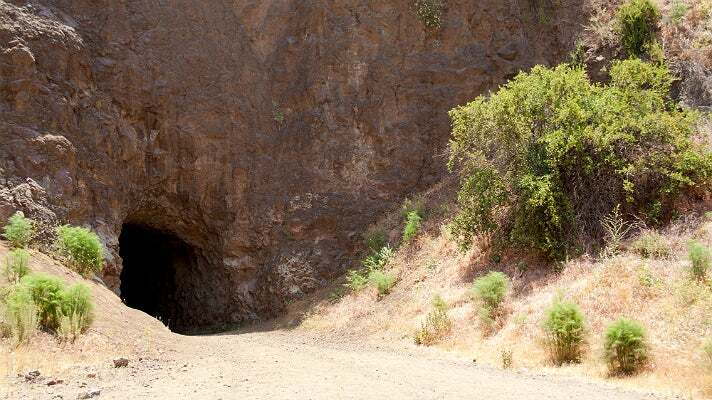 The tunnel entrance is best known as the mouth of the Batcave from the 1960s Batman TV series. If you're tuckered out from your first day of outdoor adventure, you can enjoy dinner and drinks at Mama Shelter's on-site restaurant or the rooftop, which offers sweeping city views and doubles as an outdoor yoga studio. 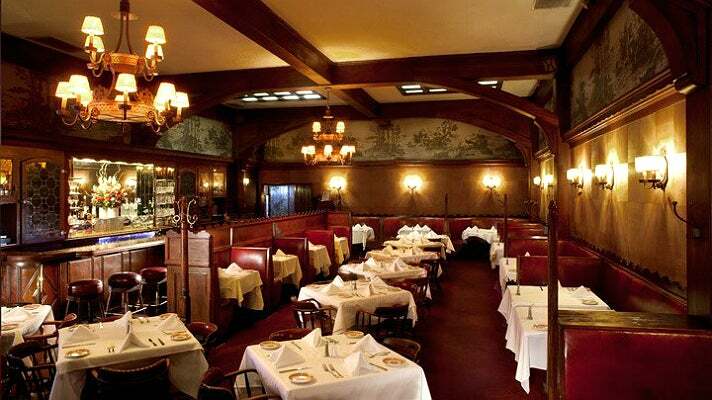 For a quintessential L.A. dining experience, slip into a booth at Hollywood's oldest restaurant, Musso & Frank Grill. Generations of movie stars have enjoyed Musso's legendary Martinis and classic steakhouse fare. You can sit in Charlie Chaplin's favorite corner table and tuck into favorites like the Porterhouse Steak and old school dishes like Grenadine of Beer or Welsh Rarebit. 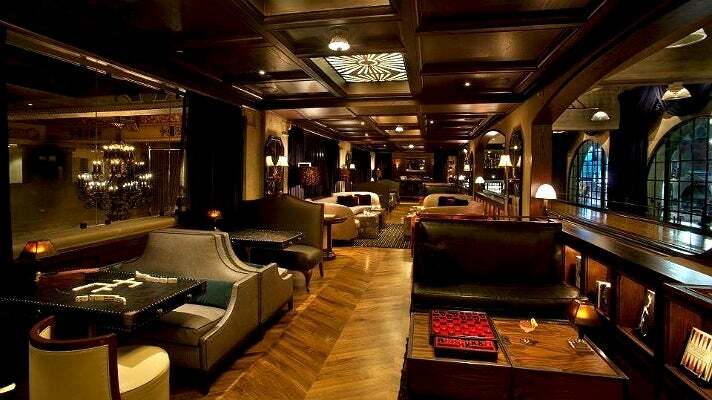 After dinner, head back to the Roosevelt and upstairs to The Spare Room, a classic gaming parlour and lounge. Bowl a few frames in the vintage two-lane alley, or unwind with a vintage board game and a round of craft cocktails. 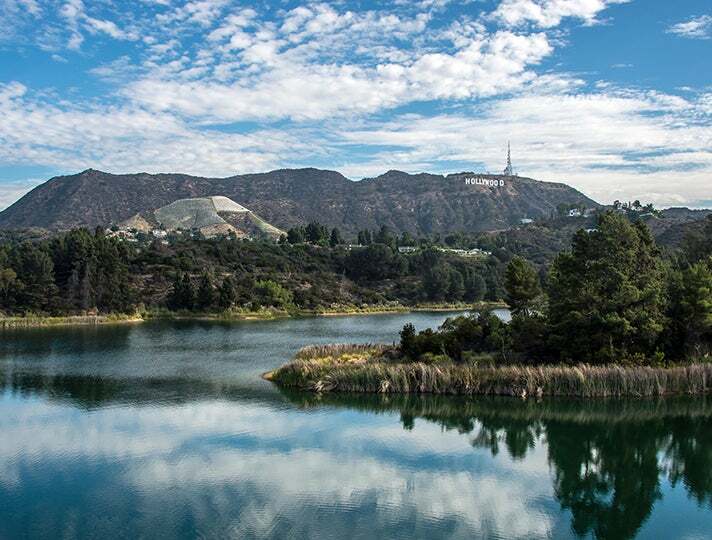 Thanks to the reopening of its western side in April 2013, the trail around Lake Hollywood Reservoir is fully restored and continues to be a great way to enjoy a walk, jog or bike with Hollywood views. It starts on the northwest side with available parking on Lake Hollywood Drive. Along the way, you’ll encounter ducks, views of the Hollywood Sign and the beautiful Mulholland Dam. 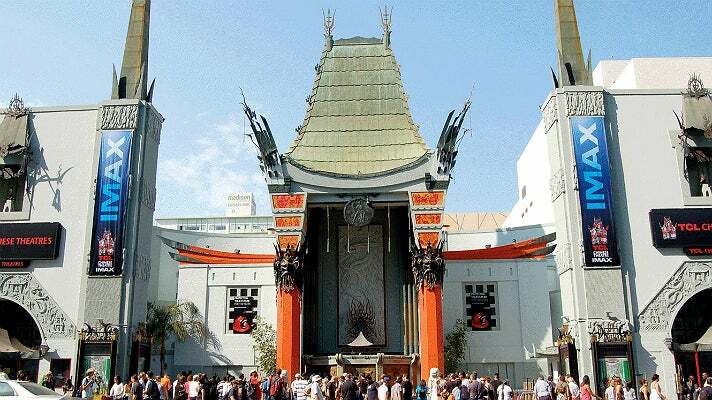 Departing from West Hollywood, Bikes and Hikes Hollywood Adventure takes you on a pedal-powered tour of Tinseltown’s most storied landmarks, from the iconic Capitol Records Building to the historic Paramount Pictures Studios. Designed for cyclists of every level, this adventure takes you through Hancock Park (the original Beverly Hills), then on to the Original Farmers Market, Hollywood Forever Cemetery, CBS Studios, Hollywood Walk of Fame, TCL Chinese Theatre, and the Dolby Theatre (home of the Oscars). 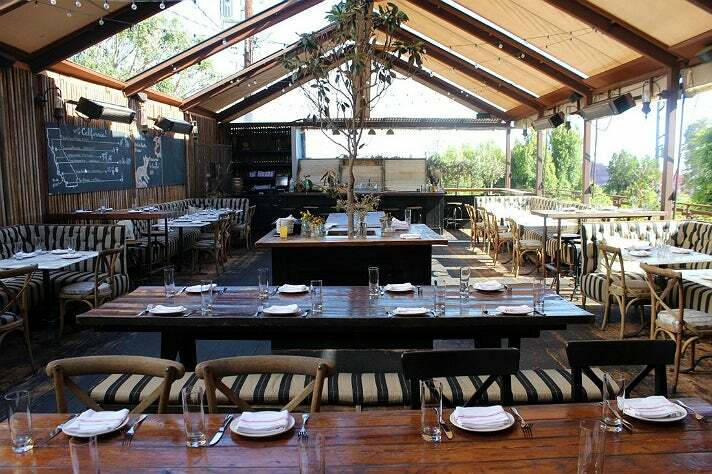 Patio at Eveleigh | Photo courtesy of American Awning & Blind Co.
After your bike adventure, stay with the outdoor theme for lunch at Eveleigh, located on the famed Sunset Strip in West Hollywood. Get seated on the beautiful patio and enjoy farm-to-table cuisine with small plates or large format dishes in warm, rustic setting. Trade in your bike saddle for an entirely different kind of saddle at Sunset Ranch. Nestled in the Hollywood Hills, this horse stable offers a variety of guided tours, from short one-hour jaunts to more elaborate excursions. 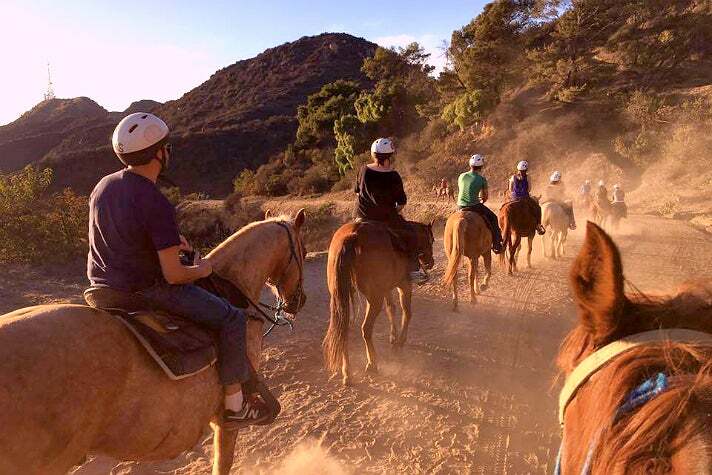 The “Best View and BBQ” sunset ride takes guests over the Hollywood Hills, and concludes with a catered barbeque feast and live country music. For an indoor adventure that will have you soaring like a superhero, take flight at iFLY Hollywood, located at Universal CityWalk Hollywood. This thrilling attraction is the best way to experience skydiving without the sky-high price tag and the constant danger of something going wrong. You'll float on a wall-to-wall cushion of air in a flight chamber - iFLY will provide all the gear and an instructor will guide you through the unforgettable experience. A Hollywood landmark for decades, the 101 Coffee Shop (formerly the Hollywood Hills Coffee Shop) is best known for its appearance in the indie hit Swingers and more recently on the HBO series, Entourage. 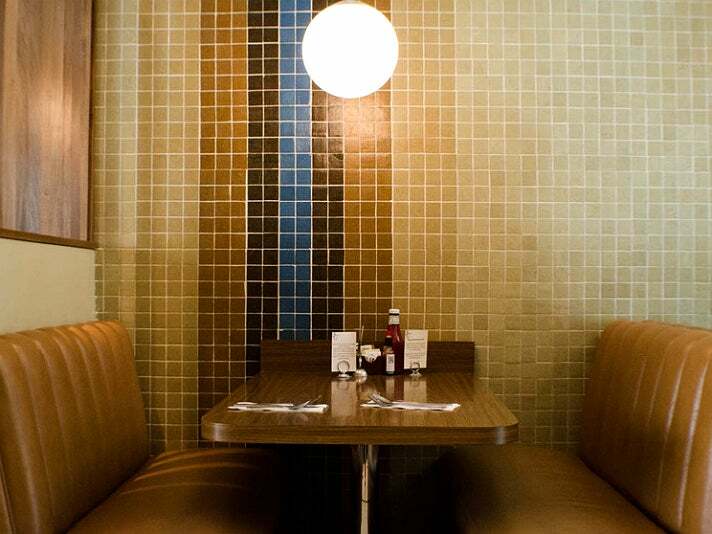 Located at the Best Western Plus Hollywood Hills Hotel, the 101 Coffee Shop was restored to its Mid-Century glory in 2001, complete with dark wood-grained Formica, sparkling "cottage-cheese" ceiling, and decorative rocks. The retro-diner setting is perfect for Chef Brandon Boudet's comfort food menu, which is served until 3 a.m. Signature dishes include Cajun Catfish and Eggs, 101 Salad, and Silver Dollar Buttermilk Pancakes. Go meatless with the No Huevos Rancheros, a spicy vegan variation of the classic brunch dish with a scramble of tofu, soy chorizo, corn and peppers. 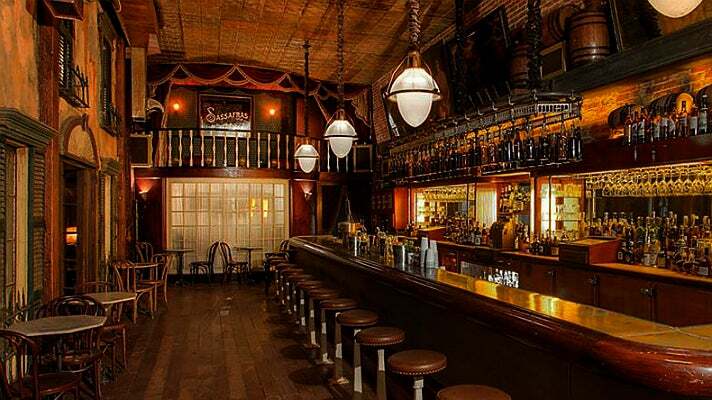 Your weekend concludes with a "detour" to the South, courtesy of Sassafras Saloon. Located on Vine Street, Sassafras incorporates an actual Savannah townhouse into its stunning design. Step into the dimly lit interior and you'll feel transported to the bayou - there are plants flourishing throughout the bar, wicker chairs, faded portraits of Southern patriarchs, antique mirrors, and a creaky conveyer belt above the bar that displays rotating bottle-aged drinks. As you sip on a classic Sazerac and the blues band jams from the balcony, you'll wish your Hollywood adventure would never end.